EEG will be releasing eight new films in 2017, as announced at a promotional event at the 2017 Hong Kong International Film & TV Market, or FILMART. It is being held at the Hong Kong Convention and Exhibition Centre in Wan Chai. Led by EEG chairman Albert Yeung (楊受成), the company’s film production subsidiary Emperor Motion Pictures announced eight upcoming films at this year’s FILMART for 2017. The films include Meow <喵星人> starring Louis Koo (古天樂), 77 Heartbreaks <原諒他77次> starring Charlene Choi (蔡卓妍) and Pakho Chau (周柏豪), My Love Rival Son-in-Law <我的情敵女婿> starring Simon Yam (任達華), and Insomnia <失眠> starring Michelle Wai (衛詩雅). 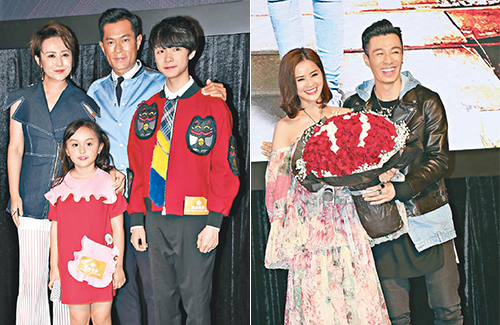 Among the stars who attended the press conference to announce the films were Lau Ching-wan (劉青雲), Anthony Wong (黃秋生), Gordon Lam (林家棟), Kara Hui (衛英紅), Alex Fong Chung-sun (方中信), Gillian Chung (鍾欣潼), Carlos Chan (陳家樂), and more. In addition to the eight films that were announced, Albert Yeung said EEG has already set out plans to invest in bigger productions in the next two years. The studio has just green-lit a film about the ICAC, which will be directed by award-winning collaborators Alan Mak (麥兆輝) and Felix Chong (莊文強). EEG is also producing Dante Lam’s (林超賢) Operation Red Sea <紅海行動>, which is currently filming in Morocco. Directed by Benny Chan (陳木勝), Meow is a sci-fi comedy film about an abnormally large alien cat that invades a Hong Kong family. Louis Koo and Ma Li (馬麗) star in the film as a couple, with child actors Liu Chutian (劉楚恬) and Andy Huang (黃星羱) as their children. 77 Heartbreaks recruited the same team behind 2015’s Sara <雛妓>, the film that earned Charlene her second Best Actress nomination at the Hong Kong Film Awards. Directed by Herman Yau (邱禮濤) and written by Erica Li (李敏), the film stars Charlene and Pakho as a longtime couple going through a bump in their relationship. Gillian Chung guest stars in the film.